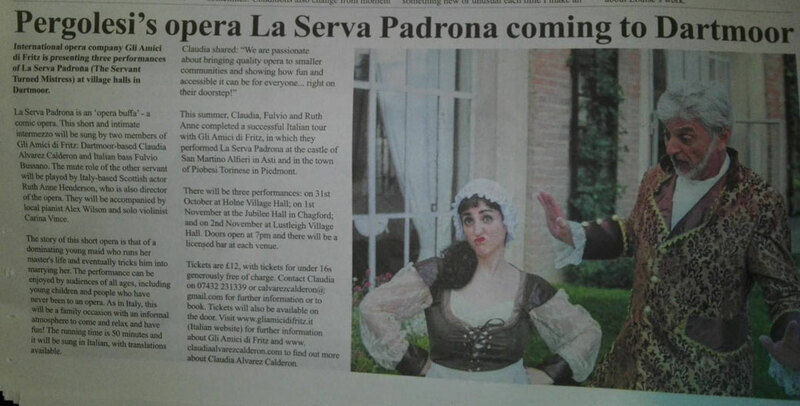 Pergolesi's La Serva Padrona (The Servant turned Mistress) in Devon with Italian opera company Gli Amici di Fritz! The story of a dominating young maid who runs her master's life and eventually tricks him into marrying her. 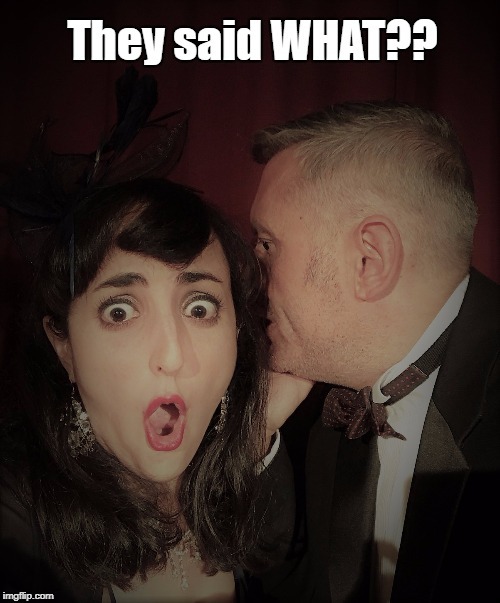 This short and intimate comic opera or "intermezzo" will be sung by two members of the international opera company "Gli Amici di Fritz" : Dartmoor based Peruvian-Italian coloratura soprano Claudia Alvarez Calderon and Italian bass Fulvio Bussano. The mute role of the other servant will be played by Italy-based Scottish actor Ruth Anne Henderson, who is also director of the opera. They will be accompanied by local pianist Alex Wilson and solo violinist Carina Vince. 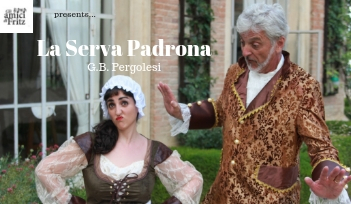 In summer 2018 Claudia, Fulvio and Ruth Anne completed a successful Italian tour with Gli Amici di Fritz in which they performed La Serva Padrona at the castle of San Martino Alfieri in Asti and in the town of Piobesi Torinese in Piedmont. They are making their first tour of village halls in Dartmoor this autumn. The performance can be enjoyed by audiences of all ages, including young children and people who have never been to an opera. Like in Italy, this will be a family occasion with an informal atmosphere to come relax and have fun! The performance is about an hour long and it will be sung in Italian with translations available. There will also be a licensed bar. All performances start at 7:30pm with doors opening at 7pm. Below is a short clip from the performance at the castle of San Martino Alfieri. Enjoy! "..we play your CD every day and find even more beauty in your singing and Steve's playing each time!" "such a wonderful way to spend an afternoon, thank you"
"An excellent presentation, very very professional. One doesn´'t expect this calibre in a Village Hall. 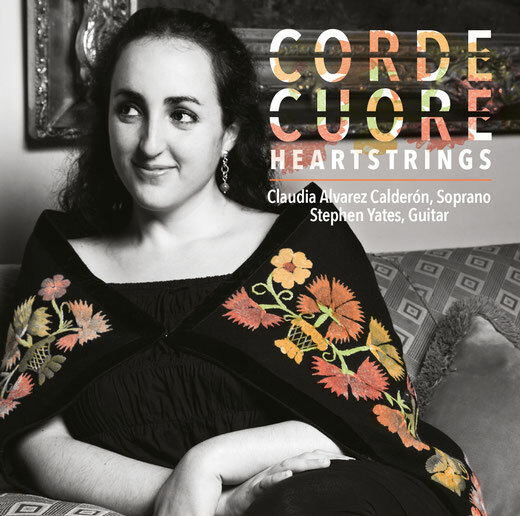 Well done"
"Extremely enjoyable, with a good variety of opera styles. If only it were longer"
"Delightful journey through different forms of opera"
"Enjoyed it more than I thought I would!" 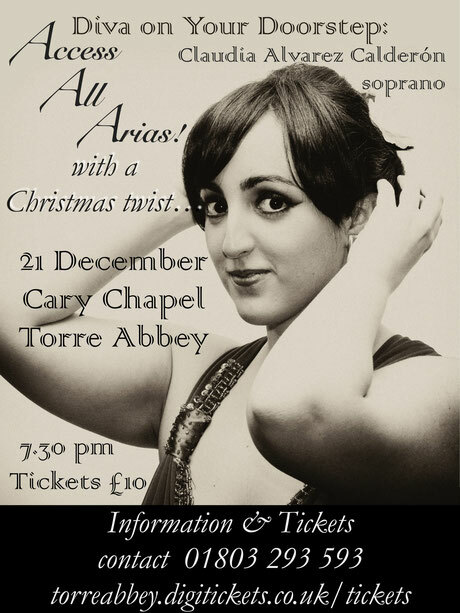 "So moving - Claudia made me cry because her voice is sublime"
"A beautiful and unusual selection of arias. Uplifting and what an amazing voice. A sumptious and joyful evening"
"Wonderful singing and playing. Enjoyed the story summaries, their delivery and the dramatic playing out of the characters. This is an inspiring idea, feels intimate and special in Village Hall setting - brava!" "Beautifully exquisite. Converted me to opera! Will come again." "An excellent evening, lovely voice, superb range and breath control plus inspired keyboard contributions. Thank you!" "Simon, excellent front man, very personable. Wonderful voice and animation, very expressive. 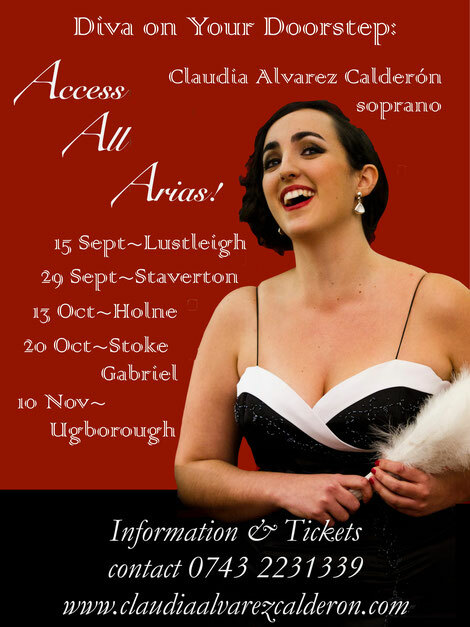 A great combination"
"The voice just carried me to another place"
“Diva on Your Doorstep: Access all Arias!” will include opera arias and solo piano pieces from Baroque to Bernstein. Join us for a fun filled evening of song - on your doorstep! 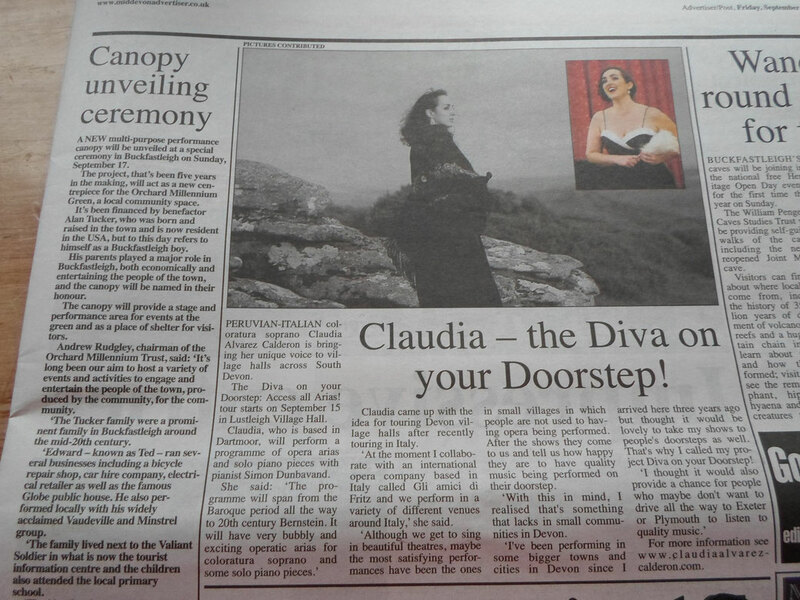 Why "Diva on your Doorstep"? Since I started my collaboration with the international opera company based in Italy "Gli Amici di Fritz" I found that some of my favourite performances have been the ones done in small villages and towns, where opera isn't normally performed. That's why I decided to do the same for villages in Devon as it's something I'm sure people will enjoy! You'll be able to have a lovely evening of thrilling and beautiful music, not far from home and without thinking about having to drive far or worry about parking.